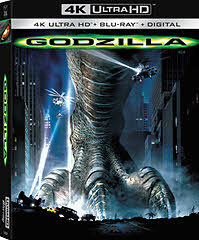 GODZILLA®, the action-packed 1998 monster spectacle from Roland Emmerich and Dean Devlin, the filmmaking team behind Independence Day, debuts on 4K Ultra HD™ May 14 from Sony Pictures Home Entertainment. Matthew Broderick (Ferris Bueller’s Day Off) and Jean Reno (Léon: The Professional) team up as the unlikely heroes out to save New York City from the giant, fire-breathing monster and its babies hatching in Madison Square Garden. Fully remastered in 4K from the original camera negative with High Dynamic Range, GODZILLA® on 4K Ultra HD also includes new earth-shaking Dolby Atmos sound. The 4K Ultra HD disc also includes three trailers, including the original iconic teaser!